NASA’s Cassini probe will be making a “plume dive” Wednesday to sample the mysterious spray observed coming from Saturn’s moon, Enceladus. The dive will be the “deepest-ever” sampling of the icy plumes which are thought to come from a massive ocean below the moon’s icy crust. Enceladus, the sixth largest moon orbiting Saturn, is considered a place where life could have evolved given the apparent presence of liquid water and likelihood of hydrothermal activity as the moon is pulled and pushed by Saturn’s massive gravity. This artist’s rendering showing a cutaway view into the interior of Saturn’s moon Enceladus. 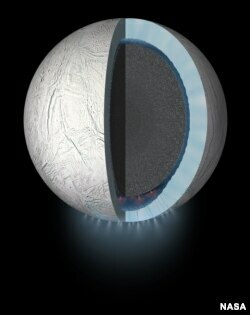 NASA’s Cassini spacecraft discovered the moon has a global ocean and likely hydrothermal activity. A plume of ice particles, water vapor and organic molecules sprays from fractures in the moon's south polar region. NASA said the flyby is not intended to detect life, but could shed light on the potential for life by analyzing organic molecules contained in the plumes, which emanate from the moon’s southern polar region. Many other questions remain about Enceladus’ plumes, including if they are “individual jets’ or “icy curtain eruptions.” Knowing this will give researchers a better clue about how much material is being sprayed into space. The amounts of spray could also be an indicator as to how long the moon has been actively releasing materials. Cassini was launched in 1997 and arrived at the ringed planet in 2004.